Saigon has grown up since we were last here ten years ago. Also known as Ho Chi Minh City (HCMC), Saigon is not the capital of the country but it is definitely the economic hub and heart of Vietnam. More people from other parts of the country are moving here for better job opportunities and because the city is so alive. But even though Saigon is moving forward into her future, there are still remnants of the old life still going strong. Even her name brings up questions. Is she Saigon or is this Ho Chi Minh City? 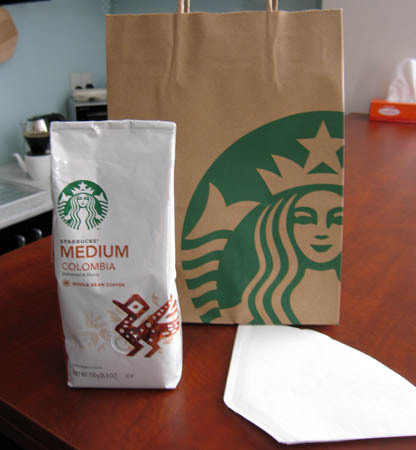 Coffee is a big deal in Vietnam and is one of the most common drinks with coffee shops everywhere. You can get traditional Vietnamese coffee served with condensed milk over ice but you can also get cappuccinos, lattes and dessert coffees too. 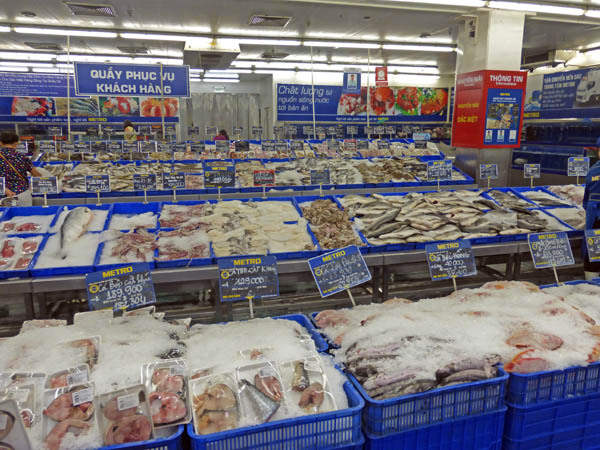 Prices range from 15,000 VNDong (75cents) to 150,000 VNDong ($7.50USD). Coffee shops almost always have people in them because friends come together in the shops, but businessmen transact business here too. You will also see people quietly reading books or working on their computers. There is no need to own a brick and mortar building to set up shop. 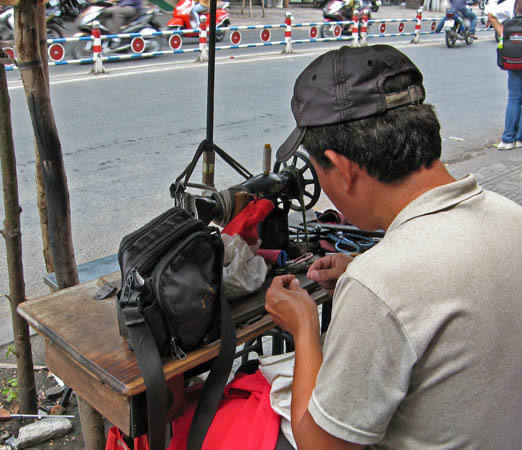 This man's business is right on the street and people come to him to have items altered and repaired. Billy got his travel bag repaired by this man in less than 5 minutes. It cost him 20,000 VNDong or $1USD. HCMC is a city of 8+ million people and at least that many motorbikes. At any corner or stoplight you will see swarms of them, most with two and three passengers riding. Crossing the street on foot takes a bit of courage. If there is no crosswalk with a green light, you simply walk out into traffic slowly and the traffic will move around you as you make it to the other side. 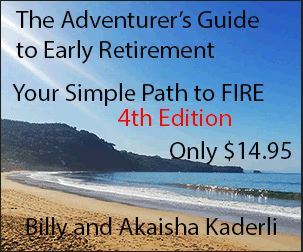 It's important not to make any sudden moves as that will disrupt the steady flow. Motorbikes are the family sedans. They are affordable and get good gas mileage. Sometimes you will see the whole family on a bike with babies in their arms or in carry baskets! We have seen little chairs installed right in front of the main seat so that another passenger may ride. Notice the Gucci label on the front of this motorbike. You can get just about anything here at the Metro Mart. The store is huge, well lit and clean. Prices are very reasonable also. Above you see the catch of the day and on the sides here and in the back of these iced fish crates are live tanks where you can catch exactly the fish, crab, lobster or shrimp you want. If you can attach it to your motorbike, you can carry it. 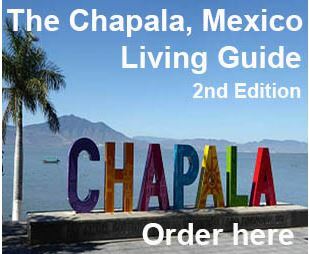 As far as we could see, there were no rules prohibiting what or how much one could transport on their motorbikes. We saw more people wearing helmets on this visit than on our previous one, but there is still a sense of freedom from regulation. 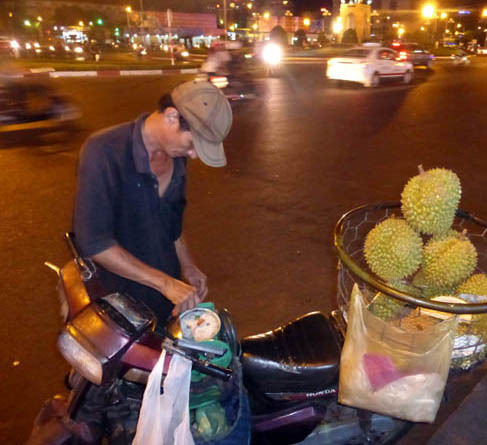 This man is selling durian a fruit that is often called "the King of fruits"
This vendor is taking a break sitting on her little red stool which is a bit smaller than the ones used for customers. This is definitely "old" Saigon. These "pole vendors" carry a very heavy load! Notice her mask to prevent breathing all the car fumes and soot on the road as she makes her rounds. 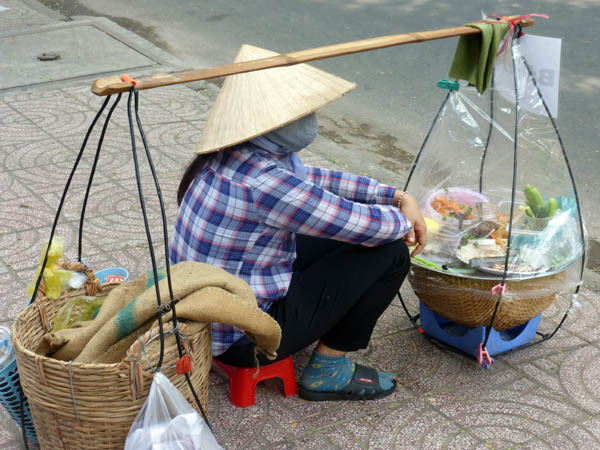 Vendors often cover up completely to keep from receiving any sun to color their skin. On our previous visit we often saw people wearing long gloves as well but we aren't seeing this so much on this visit. 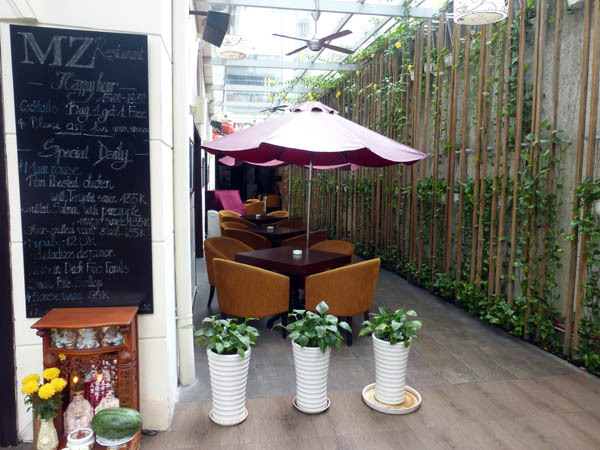 In this little cafe you can still see the French influence so prevalent in Saigon. Sai Gon is the name the French gave to this city in the 1860's. With the Communist victory in 1975, the city's name was changed to Ho Chi Minh City. But there are so many businesses like restaurants, hotels, even hospitals still named Saigon. There is a very popular beer named Saigon Beer and it comes in a red or green label. More French influence here with the baguette's presence. This vendor makes a variety of sandwiches to sell. You will find these food stalls spread about the entire city selling all sorts of things. As part of the new Saigon, there are lots of name brands here. 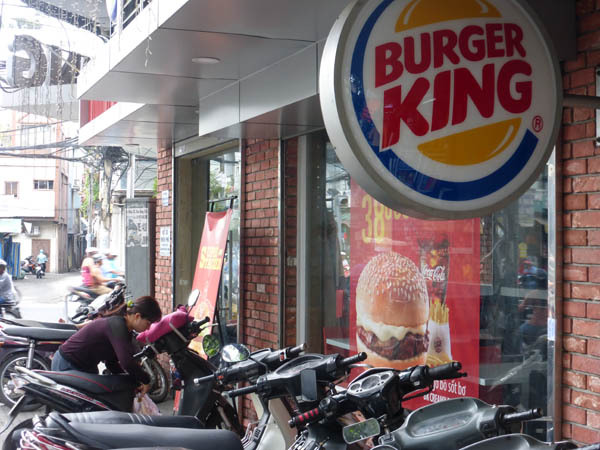 You will see Burger King, Starbucks, and KFC among others. They are very popular and carry a certain status about them. This is straight out of old Saigon. 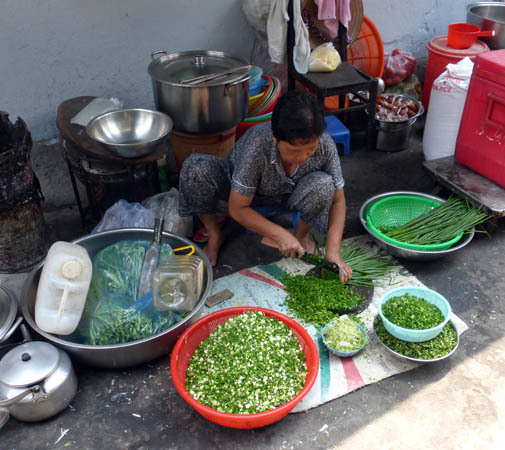 Billy took this photo down an alley where a woman is slicing green onions and other "weeds" to sell. Her pots and steamers are behind her and there is a charcoal grill in the upper left of this photo. She might be making a soup (other items in the coolers to the right) or she might just be selling chopped green vegetables. We see people slicing bamboo, shaving onions and celery, and cleaning bundles of herbs at their sidewalk stalls. Notice that she is barefoot. 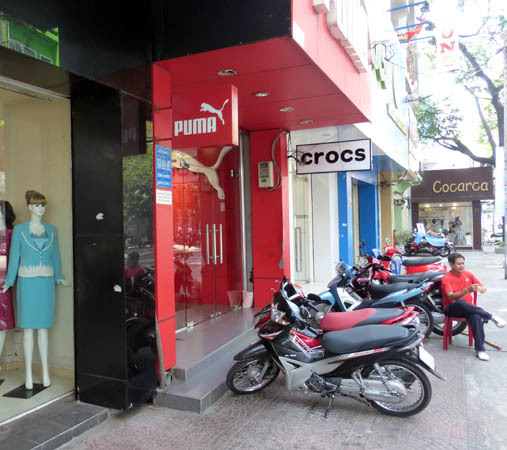 More name brands here with Puma and Crocs. 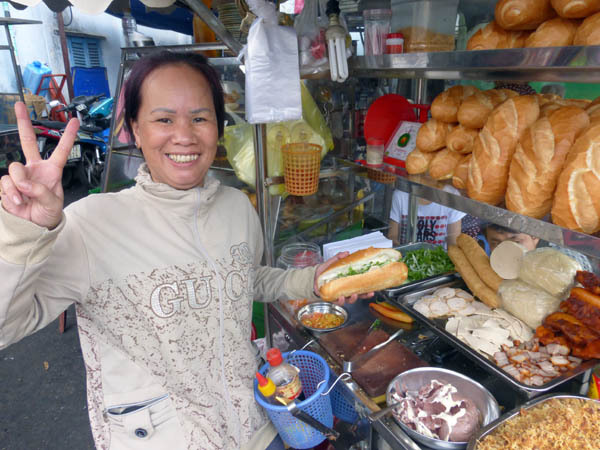 Food stalls are everywhere and they sell steamed rice buns, sandwiches, sauteed items, rice dishes and noodle soup. 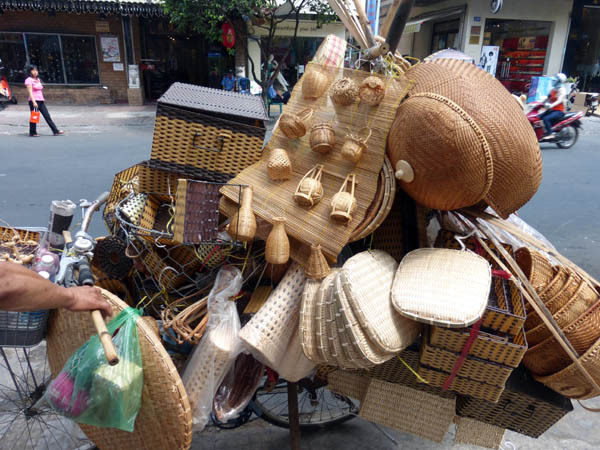 This basket vendor has a variety of woven items all tied to his bicycle. 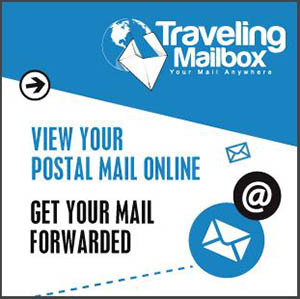 There are mats, baskets, bottle covers, lids, trays and more. This young woman is selling colorful helmets for bicycles and motorbikes. She is definitely part of the New Saigon zooming into the future. We have seen helmet stores featuring specialty painted designs on their headgear. 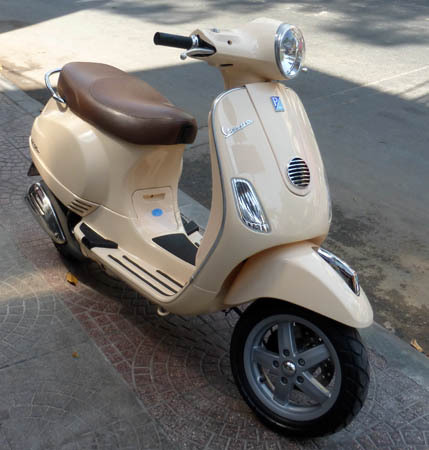 This used to be the standard mode of transport in Vietnam. 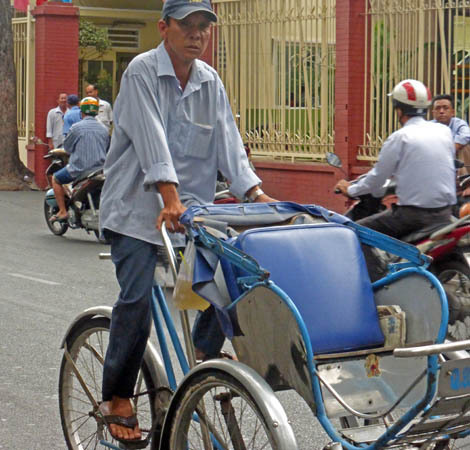 Many cyclo drivers fought for the South Vietnamese side in the American War and after re-education camp, they were not allowed to be employed as anything other than tour guides or as a cyclo driver. Not making very much money, many cyclo drivers cannot afford a home, a wife or children. 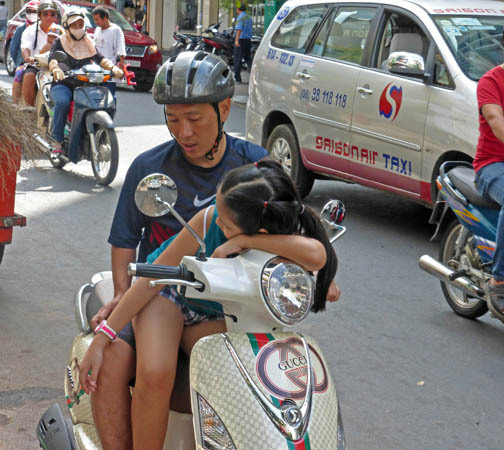 This photo shows you a blend of both Old Saigon and New Saigon. The building in the background is a brand new 7 story shopping center called Union Square which is packed with name brand shops such as Lacoste, DKNY, Tommy Hilfiger and Calvin Klein. 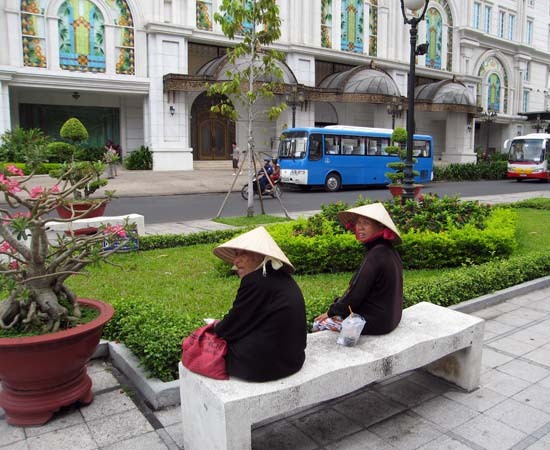 The two women wearing the traditional conical style hats called non la sit on a bench. More than likely, they have seen their country at war with the French and then with the Americans. The world continues to spin and Saigon with it. 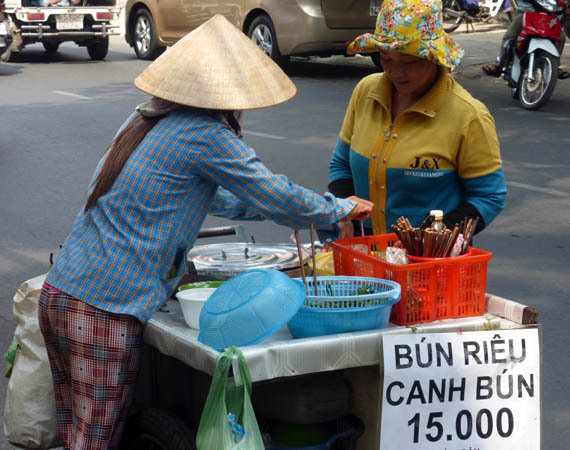 Ho Chi Minh City embraces her future.